Meet at 7.15 and depart at 7.30. We are comparing Pompeii Day Trip from Rome Prices from leading ticket suppliers and Try to find you Cheap tickets prices on the market. This exciting day trip brings you to the heart of the UNESCO protected city of Pompeii and the infamous Mount Vesuvius which caused the great city to lay hidden beneath ash for nearly 2,000 years. This tour is great for families, history lovers or outdoors enthusiasts as there's a little for everyone. First, depart from Rome in a comfortable coach, travel through the Italian country side, then dive back in time to the Roman City of Pompeii. Your guide will lead you through the maze of cobbled streets and well-preserved buildings, pointing out the ancient baths, temples, homes, tombs and amphitheatre. Despite its age frescoes and mosaics can still be seen on the buildings interiors. After lunch in a typical Italian Pizzeria you'll begin the second part of the tour. From April to October (weather permitting) you'll be driven to the foot of Mount Vesuvius, for panoramic views over the bay and the sprawling city of Naples. The more adventurous have the option to summit the volcano and peer into its crater. This full-day excursion is aimed at adventurers, photographer, history-buffs and people who would like to enjoy a day exploring Southern Italy. The opportunity to climb to the crater of Mt. Vesuvius should appeal to active and outdoorsy people. The ruins of Pompeii are a ‘must see' when you visit Rome. Your Experience With Pompeii Day Trip from Rome? Combine two ‘must sees' in Southern Italy; the ancient UNESCO protected city of Pompeii and Mount Vesuvius. 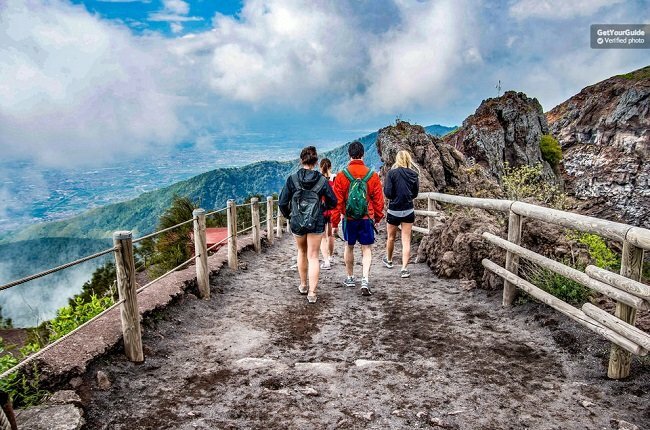 Learn about the 2,000-year-old city from a local historian guide, climb to the summit of Mount Vesuvius and enjoy a delicious lunch time pizza. Travel in comfort on an air-conditioned bus from Rome. What Pompeii Day Trip from Rome Includes? Round trip transportation by coach. Entrance fees for Pompeii and Mount Vesuvius. Central Rome – tour of Pompeii – lunch – visit Mt. Vesuvius – return to Central Rome. Try to book this tour during the summer season because it may not be possible to visit Mt. Vesuvius in bad weather. Charge your camera the night before this tour and be prepared for some breath-taking panoramas! Travelers Reviews about Pompeii Day Trip from Rome? Travellers will tell you NOT to miss this full-day trip from Rome. The Pompeii and Mt. Vesuvius excursion has a 4.8-star rating on Get Your Guide and 5-star ratings from thousands of customers on Viator and Trip Advisor. Comments agree that this is an unmissable trip, very well organised and conducted by super guides. Printed or mobile tickets are accepted. Fees may apply for cancellations made less that 7 days in advance, please check policy when booking. In the event of severe weather (and from November to March) you will visit the Archaeological Museum of Pompeii instead of Mount Vesuvius. Order of itinerary may vary. If you wish to climb to the summit please bring good walking boots, water, and extra clothing. Comfortable shoes are recommended for the entire tour. Large bags are not permitted inside the attractions. Meeting Point: Piazza del Popolo, Central Rome.